Apples own iMoviefor iOS devices may have some stiff new, and free, competition. Vimeo has just updated Cameo to version 2.0, brining a singular new focus to the app. In previous versions, Cameo had little bit of everything, including a social network and music discovery functionality. But Vimeo has pivoted the app to what it does best video editing. Heres a quick video that shows off the newly updated app. Click here if you cant see it. 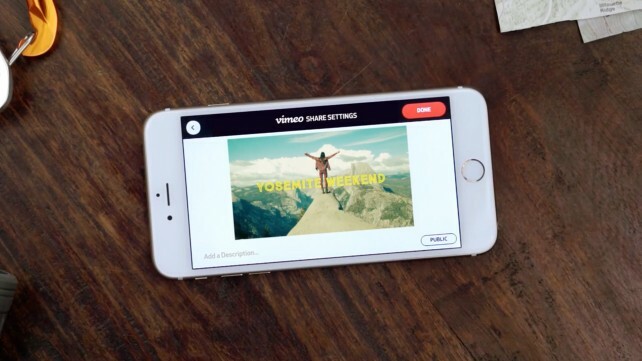 Users can now make and upload 1080p high-definition videos directly from their iPhone. The simpler design also makes it easy to import clips directly from the Camera Roll and trim and splice with just a few swipes.Local rendering also helps to create videos much faster, even while not connected online. With a curated and updated music catalog, you can also select from a nice number of free and licensed tracks to use with a video. Finally, thanks to full Vimeo support, users can upload the videos to the site or share them via a number of other networks. Cameo by Vimeo is designed for the iPhone/iPod touch. It can be downloaded now on the App Store for free. Ive previously been a big iMovie fan for video editing on my iPhone and iPad, but Im really intrigued with Cameo. Its simple interface and powerful editing controls really look great. I’m looking forward to trying it out. For other app news today, see: GivingTales features celebrity narrators, supports Unicef, Keep your family secure with Pumpic Mobile Monitoring, and Throw around the virtual pigskin with Joe Montana Football.